This project was created on 09/25/2018 and last updated a month ago. H-Bridge&apos;s are typically used in controlling motors speed and direction, but can be used for other projects such as driving the brightness of certain lighting projects such as high powered LED arrays. 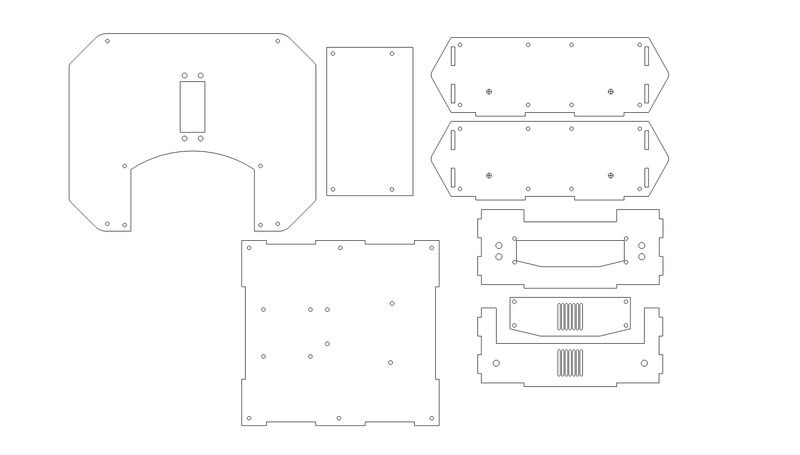 This M1rover package entails basic components while the top plate allows for easy mounting of any sensing, manipulation or computer hardware. Simply attach sensors to the onboard and Rover power supplies to get started. The Explorer package enables basic indoor and outdoor autonomous functionality, and instate of IP camera I used a mobile phone cam connected to the internet via IP address. The Explorer package enables basic GPS tracking of course while the vehicle is outdoor, it’s very cool when you watching the coordinates paths in the real-time. It can be programmed to be self-driving follow a set of instructions or even be controlled from a remote computer, and it can be used via game controllers and custom joysticks like a remote control car. Another method to control the robot through a windows-based applications like a rescuer-bot or spy-bot to creep up on your friends, and it can also be controlled autonomously using self-driving code. The robotic possibilities are endless! It’s extremely robust which make it great foundation for all kinds of projects, for M1-Robot I have loads of code examples and even openCV code you can download, these are great regardless of whether you are “just getting started” or you are trying to make your robot doing really cool things. It developed in a low cost material and expendable wheeled-robot. This state-of-the art robot has the potential to be used in rescue, government, and civilian purposes. Fantastic project Ahmed! I&apos;ve ordered the parts to build one. Are the design files available for the body? Are the chassis files available anywhere? do you have an approximate parts cost? Ordering from Aliexpress it looks like the electronics components can be sourced for under $15! A step-down DC-DC converter is a small module that works like a voltage regulator but does not turn the voltage difference into heat but into additional current. They are pretty cheap depending on the current and voltages supported. Using one would allow you to get rid of the additional battery pack for the robot arm - assuming you have a beefy main battery. Nice project! I am kinda surprised that it actually works. The power supply looks a bit under powered. May be they have better 9V block batteries where you live. But in general they can&apos;t supply much current (and have very little capacity). For all the motors and servos I would rather use a lithium battery. The linear voltage regulator on the L298N board also doesn&apos;t look adequate to supply enough 5V current. It may work now but if you add your robot arm - with servos running from the 5V rail - you may run into trouble. I would suggest to use a proper step-down module that can supply a couple of amperes without over heating. Thanks a lot Florian, Actually I&apos;m planning to upgrade the Robot size and capabilities, And the first step will be using a lithium battery instated of that one. The robotic arm is powered separability by 6 volt battery (1.5 X 4 AA), and there is a place inside the chassis to fix the battery pack, So soon I upload a photos to describe this point more. And for using step-down module ... I think I have to read about it more. Fling the thing with a catapult, find it, bring it back, repeat. You are about to report the project "M1 Rover ", please tell us the reason.